If I knew the answer, I wouldn't be asking! What reason is there for this insult? I'm glad you asked! This option isn't for you. It's for people who know things. And want to share that knowledge with others. Maybe they've seen a lot of people asking similar questions on a thorny topic, or struggling to diagnose a complicated problem, or just spent hours fighting with a misbehaving hardware - and now they want to save you the trouble of even having to ask by providing both the question and its answer together. 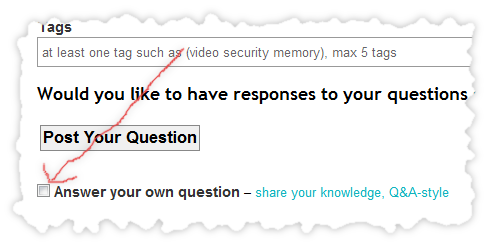 This is nothing new - it's been explicitly encouraged in the FAQ since Super User launched. But a lot of folks never realized that it was acceptable, so now we're building it right into the system. For now, it's limited to users with at least 100 rep, but this may be changed at a later point. Not the answer you're looking for? Browse other questions tagged support asking-questions self-answer . Is it kosher to accept your answer on your own question? Improving own question over time - how to? What to do if you cannot see how to improve your downvoted post? What should I do if I find my own solution to my problem? Is the Commodore 64 Mini on topic?